I teach in a simple way how to play both the melody line (right hand) and the accompaniment (left hand) for the Alphabet Song in the key of C Major. I assume you have already studied and learned the song Twinkle Twinkle Little star, as it has nearly the same melody line as the Alphabet Song. 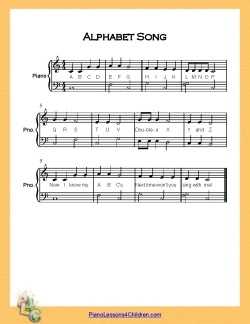 Here is a printable sheet music (PDF file) for the song "Alphabet Song". It has notes, chord symbols, and the lyrics. Use it while studying these lessons. I also have sheet music for more complex versions of Alphabet song (with more chords, with or without piano accompaniment, etc. ).